Dr. James Mortimer asks Sherlock Holmes to investigate the death of his friend, Sir Charles Baskerville. Sir Charles was found dead on the grounds of his Devonshire estate, Baskerville Hall, and Mortimer now fears for Sir Charles's nephew and sole heir, Sir Henry Baskerville, who is the new master of Baskerville Hall. The death was attributed to a heart attack, but Mortimer is suspicious, because Sir Charles died with an expression of horror on his face, and Mortimer noticed "the footprints of a gigantic hound" nearby. The Baskerville family has supposedly been under a curse since the era of the English Civil War when ancestor Hugo Baskerville allegedly offered his soul to the devil for help in abducting a woman and was reportedly killed by a giant spectral hound. Sir Charles believed in the curse and was apparently fleeing from something in fright when he died. Intrigued, Holmes meets with Sir Henry, newly arrived from Canada. Sir Henry has received an anonymous note, cut and pasted from newsprint, warning him away from the Baskerville moors, and one of his new boots is inexplicably missing from his London hotel room. 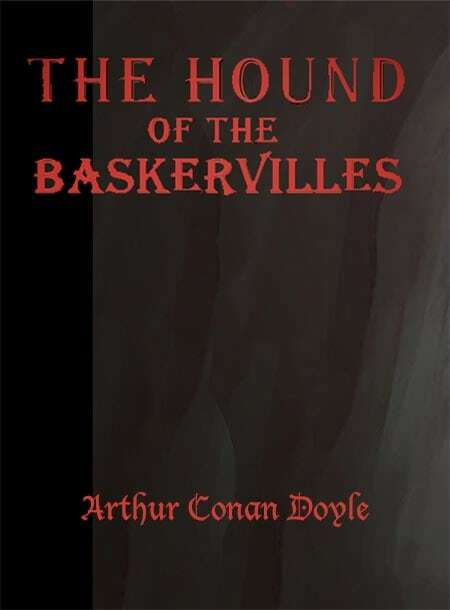 The Baskerville family is discussed: Sir Charles was the eldest of three brothers; the youngest, black sheep Rodger, is believed to have died childless in South America, while Sir Henry is the only child of the middle brother. Sir Henry plans to move into Baskerville Hall, despite the ominous warning message. Holmes and Dr Watson follow him from Holmes's Baker Street apartment back to his hotel and notice a bearded man following him in a cab; they pursue the man, but he escapes. Mortimer tells them that Mr Barrymore, the butler at Baskerville Hall, has a beard like the one on the stranger. Sir Henry's boot reappears, but an older one vanishes. Sherlock Holmes examining Dr Mortimer's walking stick Holmes sends for the cab driver who shuttled the bearded man after Sir Henry and is both astounded and amused to learn that the stranger had made a point of giving his name as 'Sherlock Holmes' to the cabbie. Holmes, now even more interested in the Baskerville affair but held up with other cases, dispatches Watson to accompany Sir Henry to Baskerville Hall with instructions to send him frequent reports about the house, grounds, and neighbours. Upon arrival at the grand but austere Baskerville estate, Watson and Sir Henry learn that an escaped murderer named Selden is believed to be in the area.